I saw this last night on TV. The fact that I had never seen it earlier and that John Madden who did Shakespeare in Love directed it, piqued my interest! Anyway, here's the review. Captain Corelli's Mandolin (2001) is a 5 star casted romantic war drama set in an unspecified island in Greece, with lots of blood and guts and mortar shells blowing up ten yards to the left of the target. The Greeks are fighting the Italians to defend their territory, which obviously has no strategic importance whatsoever to anyone. Penelope Cruz plays the female lead Pelagia for two hours without ever smiling although she first falls in love and gets betrothed to a local Greek Mandras, played by Christian Bale. He immediately leaves to fight for his homeland. She writes him 100 love letters without getting an answer. Later when he does show up he confesses he never learned to read and so couldn’t respond. Even a Greek peasant might have gotten someone else to read the letters to him, and take down a reply by dictation. After Pelagia is thoroughly upset at having been loved and left, she falls in love with an Italian soldier Captain Corelli played by Nicolas Cage. The love story is apparently adapted by someone who had read a review of Louis de Berniers' novel. Then the Germans come in on the side of the Italians. Obviously the director doesn’t like anything German and makes the characters into cartoons of stupidity. The German troops treacherously machine gun down a band of Greeks. Mandras, the original fiancee rescues the dying second fiancee Corelli, because he loves Pelagia and wants her to love him back. Most of the humor came from the older generation, especially Pelagia's doctor father played by John Hunt with enough mustachios to hide the whole cast. The love scenes were boring and the battle scenes weak, so I spent most of the two hours trying to visualize what the script looked like, with tiny bits of dialog separated by long involved descriptions of camera angles. I also looked at the elaborate sets which were used for perhaps 10 second each, thinking how they were different from a good Shakespeare production by a modern company that uses a bare stage and only those props they can carry with them. Unless you are die-hard Penelope fan, skip this. The "love of money" is indeed the root of all evil and as they say "absolute corruption, corrupts absolutely". Never were these two correct and timely phrases more prevalent as they are in Allen Hughes first solo directorial effort Broken City (2013), a crackling good crime thriller with Mark Wahlberg donning the lead role of a battered ex-cop. Wahlberg is Billy Taggart, a former cop who has now become a private investigator because of a shooting which we see in the movie's beginning. Whether he is right or not, I will not go into because it resurfaces later. Since Taggart is a better PI than he is at collecting money for his services, he is more than eager to jump at a job offered to him by NYC Mayor Hostetler (Russell Crowe). The job is to see who the mayor's wife (Catherine Zeta-Jones) is having an affair with. The job starts out easy enough but when things spiral out of control, loyalties are tested, friendships are strained, and the powerful are challenged. 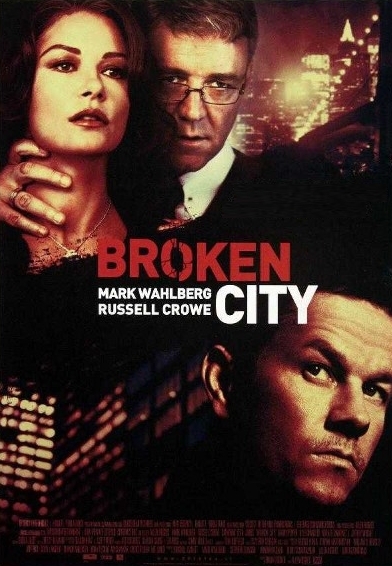 Broken City is a busy film with a number of subplots but how they are tied together is pretty craftily constructed by Hughes and first time screenwriter Brian Tucker. The casting of Broken City is first rate and the acting is superb. Mark Wahlberg shines as Taggart, a rough around the edges soul who has battled his own demons but still knows what is right and just and will not be bought. Russell Crowe is devilishly good as the Mayor who comes across as genial but is everything but that. The supporting cast with Jeffrey Wright, Griffin Dunne, Kyle Chandler, Barry Pepper, Natalie Martinez and Michael Beach are equally excellent. I was particularly impressed with Alona Tal who plays Taggart's secretary, Katy. She is sweet, attractive and yet, still maintains a tough exterior. There is are humorous scenes where Taggart and Katy are trying to get paid from clients and it is well scripted and cut together. Broken City also features a great score by Atticus Ross who also scored the Hughes Brothers' earlier film Book Of Eli. It is a slightly ambient styled score with a mixture of soft electronics and percussion that puts the viewer into an almost surreal world of New York. It is good to see that Ross is getting more work as a film score composer after his work with industrial rock guru Trent Reznor (Nine Inch Nails creator) on The Girl With The Dragon Tattoo and The Social Network for which the duo won the Academy Award. Though a tad convoluted, Broken City is a good, solid film that has interesting characters, an impressive first script from Brian Tucker, and is well acted. Hughes' direction is well paced and he never lets the story get bogged down by details, keeping the viewer intrigued to the very end when justice is served. The chips fall were they may in Broken City and no one is immune. Go watch! While poking around an old carton from the past, I discovered a long lost friend; No, not some art book from grade school, but a cherished toy. A View Master and a dusty bag full of old but great sceneries - from the Atlantic ocean to the mysterious Egyptian Pyramids, from the Inca caves to some volcano in Fiji, from the moon to the Amazon forests and a lot more to activate and flood my nostalgia buttons. 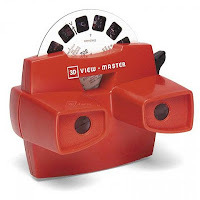 Many of us remember the View-Master from childhood, but few remember its extra dimension of depth. For those curious or have never heard or seen a view master, it a photographic reel in a cardboard disc containing 7 pairs of miniature slide film images - 14 total film chips per reel. When placed in a View-Master viewer, each image in each pair gets presented separately to each eye. Somewhere inside the brain, these images combine to produce one 3-D image. The images on View-Master reels are taken with a special dual-lensed camera whose lenses are spaced 2.5 inches apart; roughly the distance between two eyes. While View-Master cameras are no longer made today, they can be found on Ebay and other used markets for various prices depending on the model. Although they take regular 35MM slide film, you’d still need to shell out roughly some top dollars for a View-Master film cutter if you wanted to pursue View-Master photography as a hobby. Luckily, there are cheaper 3-D cameras out there on the used market - mostly cameras from the 50’s, when 3-D had a more enthusiastic audience.. While it’s far from being interactive, one could still say that the View-Master, and stereoscopic photography generally, was a good first stab at Virtual Reality. The realism of stereo photography is striking; especially when (a) it’s in color - most of us have only viewed black and white "anaglyphic" images with those red and blue glasses, (b) it’s done with slide film where you peer into a viewer in front of a light source - this pulls you dramatically into a picture, and (c) the subject matter of the images is itself striking. From the 1940’s to the 1970’s, View-Master photographers set out to conquer the world - stereoscopically that is. A variety of foreign and domestic travel reels were produced, but many can only be found today at garage sales and antique shops. Luckily for us, however, some of these reels are still being reprinted. Those who really dig the View-Master experience may want to hunt down older viewers with glass lenses, the ability to set the focus, and internal illumination with a battery powered light bulb. While viewers can sometimes be found in toy stores, I’ve yet to see any of the "scenic" reels in stores.Until then, I'll hook on to my new found collection. JohnnyTwoToes tells you why watching this true-life survival drama is uplifiting. The Impossible tells the remarkable true story of one unfortunate family's hellish "vacation" to Thailand in 2004 when it was double hit by a catastrophic earthquake and a devastating tsunami to ever hit land. The 2004 tsunami if you remember, covered over 7 continents and killed upwards of almost 250,000 people, destroyed entire towns, villages, homes, businesses and anything that stood in its path. The earthquake that hit was bad enough (9.2 on the Richter Scale) but however bad the quake was, the tsunami was even worse, if you can grasp that. How ANYBODY could have survived this is beyond me. The Impossible has been compared to Clint Eastwood's Hereafter, about people's encounter with death, one of them from a tsunami. Although, Hereafter is mostly fiction, The Impossible is a true story and that alone makes it special. One of the survivors, Maria Belon (on whose life this is based) was a technical supervisor in this movie to make sure this film about her and her family's ordeal was told as accurately as possible. Only the nationality of the family in the movie has been changed. The Belons are from Spain and the family in the film are from England. Maria in the film is played by Naomi Watts, whom the real Maria wanted Ms. Watts to play her because she was awestruck with her performance in 21 Grams. Ewan McGregor plays Maria's husband, Henry and their three children, are Lucas, the oldest is ten and Thomas and Simon are the two youngest. It is a close knit family that flies into Thailand for their Christmas holiday. On December 26, 2004 the tsunami hits, carrying Maria and Lucas in one direction and Henry, Thomas and Simon in an other. I wont spoil it further as I really want you all to see it. 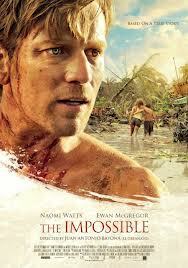 The Impossible is a powerful film. It is raw and brutal in its depiction of the disaster but it maintains a PG-13 rating so everyone can watch it. Juan Antonio Bayona (director of the fantastic horror flick The Orphanage) directs The Impossible with grace and tenderness. However, The Impossible came and went pretty quickly in theaters. It deserves a second viewing and the acting is superb. I want to acknowledge the performance by Tom Holland who plays Lucas. It is the best performance from a young actor I have ever seen. He shows remarkable maturity and depth and will have you glued to the screen. How Tom Holland was NOT nominated for best supporting actor is so criminal?